Home / Blog / Oriental Carpets, Saddle-Bags, Pillows, etc. However a man may justify himself for collecting rugs, regardless of his success, of his needs, or of his income, there would seem to be no danger of any one making a specialty of buying carpets. Except to millionaires or for clubs and palaces, space would absolutely prohibit, if the housewife did not. The nearest that the enthusiast might approach to such an ambition would be in the accumulation of hall strips; which has its own temptations, quite within the possible. And yet the term “carpet” is an elastic phrase, and any piece which exceeds six or seven feet in width and of greater[Pg 94] length, is entitled by courtesy to be named a carpet. It may be said that a rug, like a baby, ceases to be a rug at an uncertain size, and then becomes a carpet. But carpets in the larger dimensions, ten by twelve feet or more, as ordinarily understood, are only herein considered. They are really articles of utility first and always, and must answer to certain measured requirements. Such is the accepted theory and practice. The buyer is wont to think that the merit or beauty of a carpet is of secondary consideration if only it fit the room. Here is a heresy. It is far better that the room should be made to fit or adapt itself to the perfect carpet. If you would buy one, the best that you can do is to choose wisely. They are all of modern make, with very few exceptions. If you have one that is antique, you yourself have made it so, or you have inherited a ragged and neglected example of bygone years. The modern carpets, nevertheless, those still made to-day, are many of them superb pieces, far outclassing any small rugs of the same weaving. The Kirmanshahs would come first, of course; closely woven, beautiful and soft in colour, delicate and artistic in their designs, they are the most perfect floor coverings for the salon, reception or music room. If they were only real! But very, very few of them are. They have all been treated with chemicals, and their beauty of complexion is just as artificial as any rouged and bepowdered courtesan’s. Unless you have one out of ten thousand, it has not come from a palace, but from a scientific laboratory. Many of the Tabriz carpets lie under the same suspicion, and those of soft tones, claiming to be antiques, may be wisely questioned. But new ones come in clean, rich colourings, in fine designs, and are textile masterpieces. The Kurdistan carpets of to-day are by far the best of all. They are more loosely woven, but they are so much the heavier, and that, is to be desired in a carpet. And they are honest. Their colours are beautiful, varied, strong, and true. It is claimed for the Kurdistans that some of their dyes are still well-guarded secrets; and it is true history of some years ago that many a bloody feud and murder grew out of cherished Kurdistan secrets of dyeing. Their designs are bold and striking, with grand centre medallion and corners, and a field artistically adorned. Money cannot buy anything better than a fine new Kurdistan; and thirty or forty years of wear should leave it better still. Next to be chosen would be the Gorovans. They also show brave figuring with a strong centre medallion, characteristic zigzag corners, and angular ornamentations which are most gracefully carried out. Their colouring is usually in fine blues and reds. Modern Feraghans come in large carpet sizes, and some antique ones are still to be had. But the Kurdistans and Gorovans far surpass them in two important particulars. The Feraghans appear only in their own peculiar, small-figured designs, which are without strength or character on a large floor space. Besides that, being more closely cut than the others, if they do not soon wear out, they soon wear down, and begin to show the suspicion of their warp and their loss of tone and colour. They are beautiful carpets, nevertheless, and will practically last a lifetime. But the heavier they are, the better. There are few other modern Persian carpets in large sizes which come in appreciable numbers for classification. There is a rather indefinite order of Gulistans, under which title many good nondescripts are sold. There are also current Sultanabads, in very large sizes, well woven, on old models, to meet present uses. 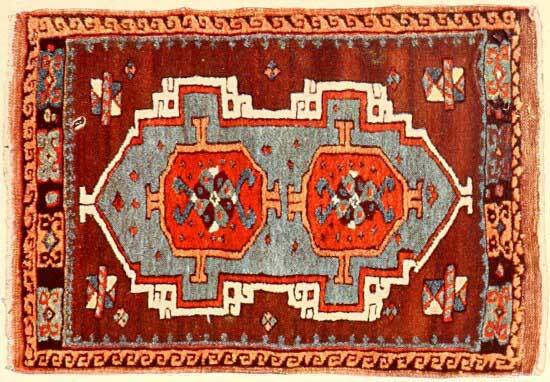 Most other carpets are of Turkish weaving, whatever their names, and come under the general title of Smyrnas. Smyrna is[Pg 98] the centre of distribution for a great variety of cheap and coarsely woven carpets; but poor in quality as these may be, they should not be confused with the American machine product also known as a “Smyrna.” In the same class come the Oushaks, Hamadans, etc. There is nothing more to be said for them than to testify that they will wear better than a Brussels carpet, and give some distinction to a modest dining-room. It is a far cry from carpets to saddle-bags, and yet these latter are of greater importance and interest to the collector. More valuable pieces of Oriental weaving are to be found among the diminutives than in the grand opera of textiles. Other bags, used on horse and camel, come in more important sizes, as large as two feet by six feet or more. Exquisite specimens of Bokharas are found among these; artistic, antique pieces, woven as fine as needlework. A number of these seem to have come suddenly on the market in some mysterious way; and they are of every size within their small limits; because, as an Oriental has suggested, there are pony camels also. Another mystery about those camel bags would seem to be that some are beautifully straight and therefore most to be desired, while others are so curved as to be impossible of use unless around the foot of a pillar. Here is a case differing from that of the ordinary crooked rug, because these bags were originally made straight and true. Overloading and overpacking have only sagged down the middle. I dare not say that the more the curve, the greater the age and the more the value; but it may be that curved Bokhara saddle-bags, passed by, by the Levite, are prizes to be picked up by the good Samaritan, and may be easily restored to normal rectitude. But the term “saddle-bag,” whether for this animal or that, is confusing and altogether too generally used. It must be borne in mind that a bag was and is an article of universal utility to the Oriental. For all purposes of travel, journeying, or visiting, it corresponds to our valise or portmanteau of to-day; or, in aptest comparison, to our “carpet-bag” of fifty years[Pg 101] ago. And, according to the taste and means of their owners, these Persian, Armenian, or Turkish carpet-bags varied in size and beauty. 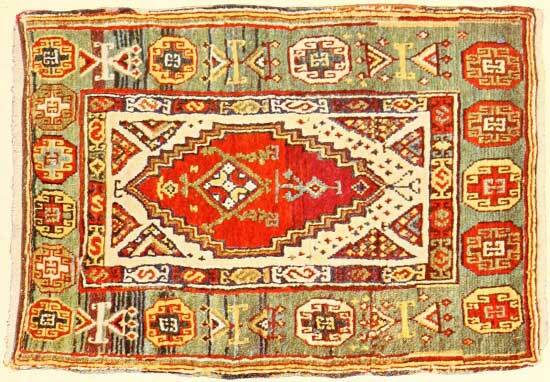 A few rare old Caucasian small rugs can only be accounted for as valued personal rug-bags of their period. Among these smaller pieces are alone to be found the most valuable of all the collector’s spoil, the small Sehnas. Very rarely they come in pairs, about two feet by three feet, and therefore could not have been used as bags for any purpose. They are pillows; and pillows of course play their important part in the ménage of the East. Besides the exquisite Sehnas, the finest of the Anatolian mats, as they are generally called, were used for pillows and not saddle-bags. The warp generally proves their purpose. When the warp runs vertically to the larger side, and ends in a fringe, that specimen was of course some sort of a saddle-bag. When the selvedge is at the shorter end you have the pillow. Among the other beautiful miniature specimens of textile art, which are still occasionally offered, are saddle-cloths. They appear mostly in beautiful Sehnas, and occasionally in fine old Feraghans and other Persian weaves. They are marred, however, for beautiful floor coverings by the necessary angular cut in them, through which the straps of the saddle passed. This is often skilfully filled in, in the case of choice specimens. But the blot remains. Their irregular shape also condemns them for the most part with the many admirable but irreclaimable crooked rugs. These saddle-bags are frequently used for table coverings or for mural adornment. But in our modern house decoration rarely does a rug look well upon the wall. The Persians hang them instead of pictures, which is well. But they do not mix them with pictures on the wall, which is better, and shows good taste on the part of the Persians. A rug appears best upon the floor. The collector of small pieces to-day will do well to buy every bag or pillow of Bokhara or Beluchistan which may please his fancy. They are to be had now at modest prices, but unless all signs fail, they will soon become as rare as any of the other miniatures. You will look in vain for them with the vanished Anatolians and diamond Sehnas.